Forest officials pose for a photograph with the teachers and students of Vidhya Bhawan School, K.Kire Colony, Kuda village, Dimapur on April 15. Dimapur, April 15 (EMN): The Nagaland Forest department organised an awareness programme for conservation of nature, forest and wildlife at Vidhya Bhawan School, K.Kire Colony, Kuda village, Dimapur on April 15. 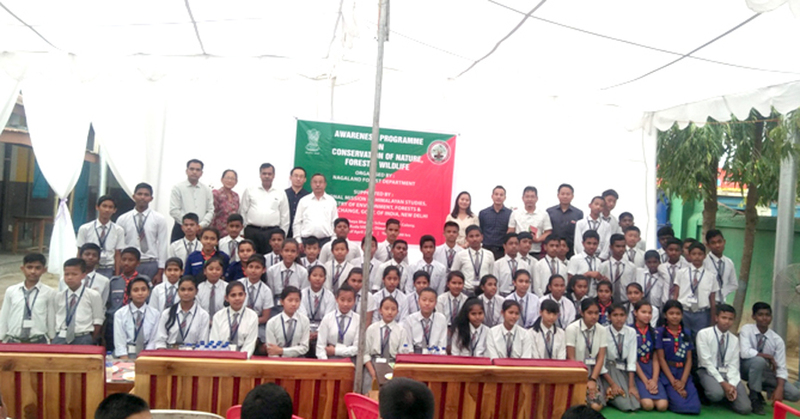 Around 400 people, including staff and students of Vidhya Bhawan School, village elders, head of institutions and officers from the forest department attended the awareness programme, informed Satya Prakash Tripathi, Chief Wildlife Warden, Nagaland. Tripathi spoke on direct as well as indirect dependency of the people on forest and wildlife. 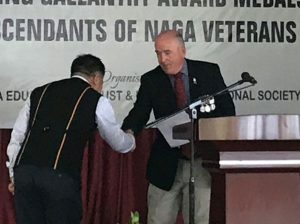 He also gave a brief background of nature learning centres being established by the Ministry under National Mission of Himalayan Studies (NMHS) in all 12 Himalayan states — Nagaland, Assam, Tripura, Meghalaya, Mizoram, Manipur, Sikkim, Arunachal Pradesh, West Bengal, Uttrakhand, Himachal Pradesh, and Jammu and Kashmir. The forest department officials cleared the question raised by the teachers and students during the interaction session. The children, who participated in the programme, were given bookmarks and nature conservation quotes. The event was sponsored by the G. B. Pant National Institute of Himalayan Environment and Sustainable Development, Almora (Uttrakahand), an autonomous Institute of the Ministry of Environment, Forest & Climate Change, Govt. of India, under National Mission of Himalayan Studies (NMHS). Tokaho H Kinimi, IFS, Wildlife Warden, Wildlife Division, Dimapur chaired the programme and Vijoy Kumar Sahu, headmaster of Vidhya Bhawan School welcomed the participants earlier during the event.